June didn't start yoga till her forties so counts herself a late starter but has never regretted that decision to go to her first class. To be more flexible and stronger than twenty years ago is a tribute to the gentle power of yoga . She says that it's philosophical roots have supported her in difficult periods of her life. Her classes aim to be an enjoyable balance between physical work and mental clarity lightened by laughter. She has a particular interest in making yoga accessible to all sorts of ages, shapes and levels of fitness. All of her classes in Aldershot (on Thursdays), Cove (on Wednesdays) and Farnborough (on Tuesdays) reflect that wish to share the joy of yoga. June has completed the British Wheel of Yoga foundation course and also their three year Teacher Diploma course with her tutor Swami Satchidananda Ma. traditional Hatha Yoga is the foundation of her classes. 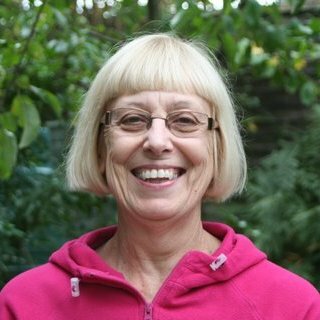 For 12 years she was the British Wheel of Yoga representative for Hampshire North. June is continually adding to her expertise with training days, extended reading, yoga retreats and also a fortnight's stay in the Omkarananda ashram in India in 2008.